This story was updated at 3:34 p.m. ET. NASA's dwindling astronaut corps will not be enough to meet the demands of future space station missions if staffing levels continue as the space agency expects, according to a new report. With the retirement of NASA's space shuttle fleet this year, the American astronaut corps has steadily been decreasing in size as U.S. spaceflyers retired or quit their posts. But NASA still needs astronauts to fly missions to the International Space Station (ISS), which is slated to run through 2020. In 1999, NASA's astronaut corps counted 150 spaceflyers in its ranks. That number has dipped down to 61 active astronauts in 2011, according to the 93-page report. Much of that drop was spurred by the anticipated retirement of the space shuttlefleet and the completion of the International Space Station in orbit. NASA's space shuttle program ended in July after the 135th flight of the iconic winged spaceships. Primary construction of the space station was completed earlier this year. NASA plans to rely on Russian spacecraft and new private space taxis to ferry American astronauts and cargo to and from the space station. "Viewed as a supply chain, astronaut selection and training is very sensitive to critical shortfalls; astronauts who are trained for specific roles and missions can't be easily interchanged," the report's committee co-chair Frederick Gregory, a former astronaut who commanded three shuttle missions and has served as NASA's deputy administrator, said in a statement. Station crews must be well-versed with the station's American-built hardware as well as equipment from NASA's Russian, European, Japanese and Canadian partners. Space Station training requires astronauts to spend time abroad in Russia and Europe to prepare for their missions. Then there are space station spacewalk repairs to train for, software systems to learn and docking procedures for the international fleet of robotic and crewed spaceships that visit the orbiting lab. "This year alone, astronauts will conduct 17 rendezvous and docking missions at the ISS," NRC officials explained in a statement. NASA must also maintain its astronaut-related ground equipment, such as its fleet of T-38 supersonic jets. The aircraft not only transport astronauts to different training sites across the country, but are also vital to helping astronauts develop the skills necessary for actual spaceflight emergencies, according to the report. NASA officials said the agency has received the National Research Council's report. "The National Research Council report offers helpful advice about the appropriate size of our astronaut corps as we enter this exciting new era of space exploration and crew transport operations," said Mike Curie, a NASA spokesman at the space agency's Washington headquarters. "It also provides guidance on the use of existing NASA facilities and other resources to train for future missions, and supports the role and definition of the astronaut corps in connection with the full utilization of the International Space Station." NASA's nine newest astronauts joined the space agency's ranks in 2009 and have been training to fly on space station missions ever since. 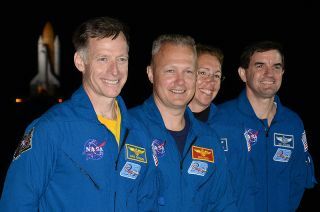 The class includes six men and three women who have been training to fly on Russia's Soyuz spacecraft and NASA's new deep space capsule, which is expected to be used for the trip to an asteroid called for by President Barack Obama. NASA's new space vision is aiming to send astronauts to an asteroid by 2025, and to Mars by the mid 2030s. "With the retirement of the shuttle program and the uncertainty during the transition to a fully operational ISS, it's even more important that the talent level, diversity, and capabilities of the astronaut office be sustained," said committee co-chair Joe Rothenberg, a former senior NASA official, in a statement. "Making sure NASA maintains adequate training facilities is also essential to ensure a robust astronaut corps."